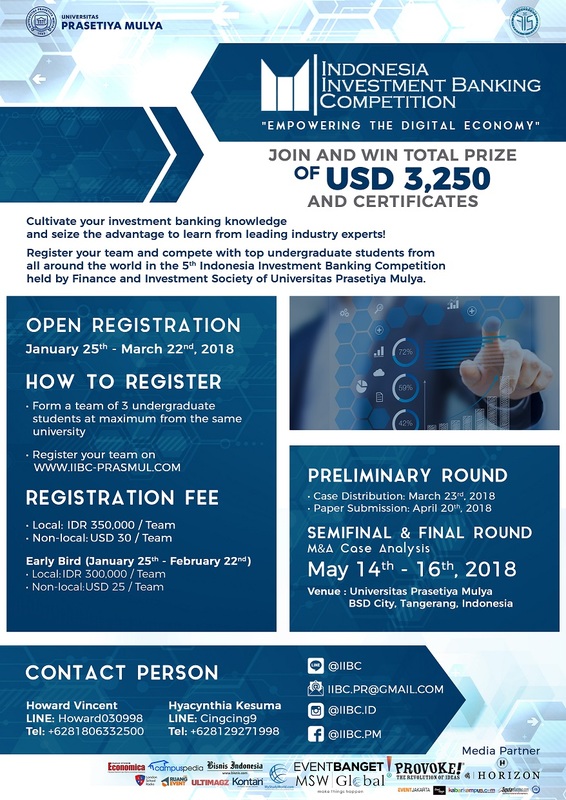 Finance and Investment Society of Universitas Prasetiya Mulya proudly presents "IIBC 2018: EMPOWERING THE DIGITAL ECONOMY"
Indonesia Investment Banking Competition is the first and the biggest investment banking competition in Indonesia! We provide an opportunity for future professionals to expand their knowledge and broaden their perspective about the financial industry especially about investment banking. Registration is open until March 22nd, 2018. Don't miss this incredible opportunity and grab the chance to win a total prize of USD 3,250!